Shawna Moore Art: Missoula Art Museum "Encaustic Invitational"
Missoula Art Museum "Encaustic Invitational"
RUBRIC AND IDIOM IN THE STUDIO 60" x 60"
The Encaustic Invitational showcases six artists from the region who have chosen encaustic as their primary medium. Curated by MAM Curator of Education Renee Taaffe, all of the artists invited are well established and have been exhibiting their work for many years. Some of these artists have worked with encaustic for decades, whereas others are relative newcomers to the process; all are still exploring the possibilities of this ancient medium. The artists invited to participate are Sara Mast, Leslie Van Stavern Millar, SHAWNA MOORE and Suzanne Truman, all from Montana, and Joseph Goldberg and Wendy Franklund Miller from the Spokane area. Encaustic is experiencing a revival as more and more contemporary painters discover its versatility and richness of texture and depth. The application of layers of wax and pigment allows for a deep foundation of image and color. The adhesive and translucent qualities of wax used in the process allow artists to add collage and textural elements to the image. The encaustic medium involves the layering of molten wax with pigment to build up an image. 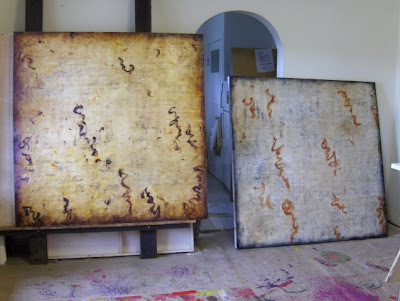 As the word suggests, (Greek: en+kaein-�to burn in�) the encaustic process involves an application of heat. In ancient times, this may have been achieved by repeatedly heating metal spatulas and keeping the wood or coal flame hot under pots of wax. Today encaustic artists keep electric irons, hot plates and blowtorches on hand. Those of us who are familiar with encaustic probably remember the reference to the Fayum funerary portraits from an Art History survey class. These portraits, done in the first and second centuries CE in Egypt, depict life-like, dark-eyed faces that after two millennia retain their vivid colors and vibrancy. The process of encaustic fell out of vogue as the more direct, cheaper and faster mediums of tempera and centuries later oil paint became the primary mediums for painting. Encaustic experienced brief revivals in the eighteenth and nineteenth centuries. In the twentieth century several painters experimented with encaustic including Roualt and Delauney and later Rauschenberg, Julian Schnabel and especially Jasper Johns. The medium of encaustic has recently gained popularity as it lends itself to the contemporary urge to layer found images and to create densely textured surfaces with minimal imagery. This is the first exhibit at MAM solely devoted to encaustic work. At first glance many of these artists seem to have a similar aesthetic and approach. Moore, Truman, Goldberg and often Miller all create work within a reductivist mode, usually with little representative imagery. The complexity of the painting appears as one looks closely at the work and notices the depth of the surface and multiple layers of color and texture embedded within. The medium of encaustic lends itself to mimicking and evoking natural surfaces and the connection is only reinforced by the scent of beeswax that accompanies most encaustic work. It is not surprising that an overarching element in this exhibition is the influence of the natural environment, particularly in the work of Mast and Millar, and the artists� representation of images may have the quality of being both a macro- and microcosmic view of the world. Whether the wax medium stems from the body of a bee or a vast petroleum field, the works draw us in to take a whiff and look closer.